We could not imagine that two differing organizations like the United States Lifesaving Association and USA Triathlon would team up in a visionary partnership. The United States Lifesaving Association (USLA) is America's non-profit, professional association of beach lifeguards and open water rescuers and lifesaving professionals. Its members works to reduce the incidence of death and injury in the aquatic environment through public education, national lifeguard standards, training programs, promotion of high levels of lifeguard readiness, and other lifesaving means. USA Triathlon (USAT) is America's official national governing body of triathlon that provides rankings, racing schedules, merchandise, and travel information for multi-sport athletes of all ages and abilities. A partnership between these two organizations would make sense, and the same with USA Swimming and U.S. Masters Swimming, but for various reasons these relationships are not formed. But, as we wrote about the epicenter of open water swimming being in Great Britain (see here), such relationships make sense. The Royal Life Saving Society UK (RLSS UK) and British Triathlon recently announced a 3-year partnership to support the promotion and development of open water swimming in Great Britain (see here). 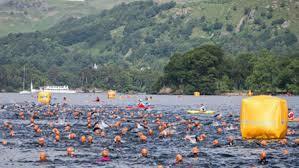 Its press release says, “As demand increases, the need to develop safe swim sites and consistent operating standards are central to delivering a positive open water swimming experience. The RLSS UK aims to lead in hosting more open water swims for all ages and abilities around the UK as well as work to help secure more safe open water swimming sites to make the activity more accessible to all, including triathletes who want to train or gain more experience of open water swimming. As participation increases, the partnership also aims to grow the number of qualified open water lifeguards who hold the RLSS UK Open Water Lifeguard qualification to compliment the network of more than 1,000 triathlon coaches, 500 RLSS UK lifesaving clubs and 65 RLSS UK lifeguard units who are already able to support swimmers and triathletes within an open water environment." This all makes sense and may influence other national organizations to work with their counterparts in the triathlon, open water swimming, and lifesaving communities.